According to lots of tweets I've seen recently, many authors are advised by their publishers not to respond to book reviews. To that I say: wuuuuuuuuuut? I 100% agree that authors shouldn't respond to negative reviews. You only need to Google 'book reviewer hit with wine bottle' and 'book reviewer stalked by author' to know that it can get messy. And even if the author replies in a polite way, it's really awkward to find out that they know you didn't like what they put so much blood, sweat and tears into. Better than being stalked for it, but still. I'm not into speaking for everyone, but I'm pretty sure that on this occasion, I speak for most book bloggers when I say that we hugely appreciate it when our positive review is acknowledged by the author. We've spent hours reading the book, and then spent even longer planning, writing and promoting the review. We're spreading the word, shouting about the book to everyone we know, increasing your sales, and hopefully helping you to realise that your book isn't as bad as you might self-consciously think it is. We don't have to do it, and you don't owe us anything, not even a speedily-typed tweet of thanks. But I'm British, so... it does kinda bum me out when I excitedly tweet an author my super-positive review of their amazeballs book, and they don't seem to care... at all. It's like when you step into the road so someone can keep walking on the pavement, and they don't even give you a nod of appreciation, so you end up muttering a sarcastic little 'you're welcome' under your breath. Just let me love you, authors. Pls. It's not a huge problem. I get that authors are busy writing their next slice of papery greatness, or talking in front of hundreds of children at a school event, or travelling across the country on tour, or doing their tax return, or making their fourth slice of toast that day. There are more important, urgent things to do than reply to a tweet. But being ignored can be disheartening, and not sharing any reviews of your book is silly in terms of self-promotion. Spread the word that other people are spreading the word about you. Tweet a link to someone's review so you don't have to send your own awkward 'buy my book' tweet. It works. Edited to add: Of course, some bloggers send neutral tweets where it's impossible to know whether the review is nice or not. In that case, you really can't expect a reply because how is the author meant to know whether to read it or not? 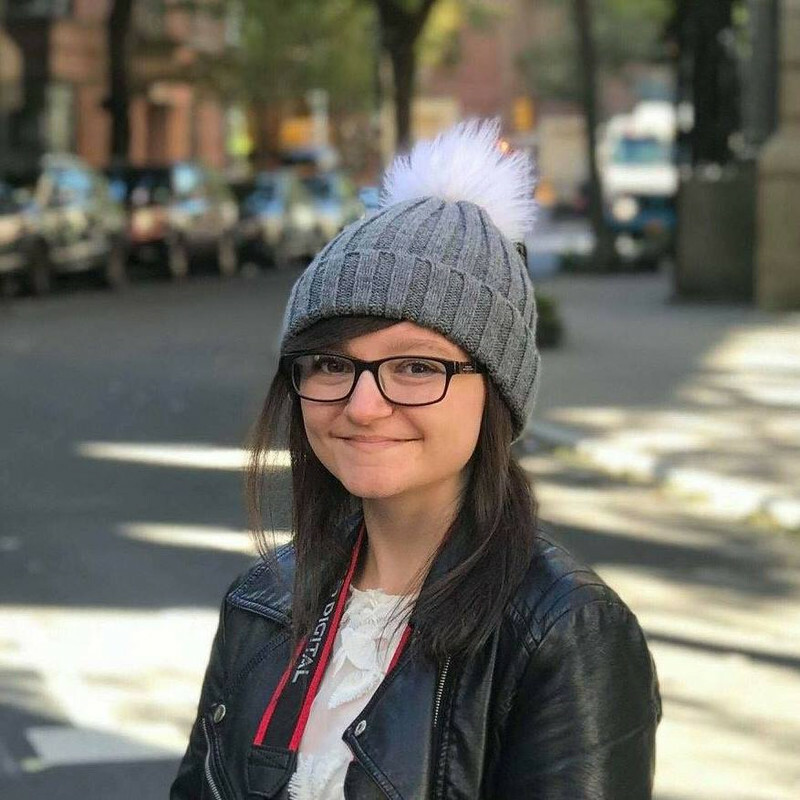 I actually wrote a post about that here. 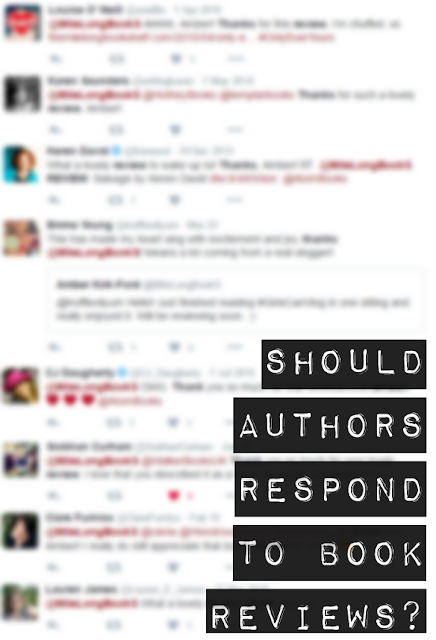 What do you think about authors responding to reviews? I'm writing this anonymously because I'm an author... so I hope you don't mind. This is a really interesting topic. I'm a book blogger, too, so I understand that an author acknowledging a positive review is awesome/gratifying/exciting. Sometimes, though, it causes less stress not too. My publisher hasn't said anything specific about it, so I just go with how I'm feeling, honestly. Sometimes it takes a lot of bravery/courage to open that link a blogger sends you. Especially if the tweet is neutral/doesn't give an indication as to whether the blogger actually likes it. Because, unfortunately, there are some people who WILL send negative reviews to you. So as an author, I prefer this: a message/tweet saying you enjoyed the book. I don't need the full review; sometimes, it's just better for my mental health. Because at this point I've done everything to the book I can & it's done and I can't change a thing. 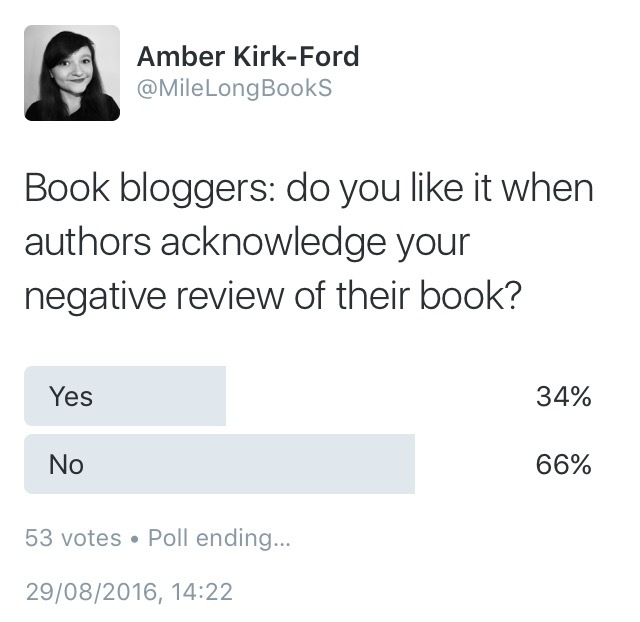 I guess publishers don't want the authors seen as favouring some people and not others? And perhaps looking like they only speak to the people that review the books positively. I guess some people could misconstrue that sort of thing if they looked at it that way. By authors not responding to any reviews at all then no one is singled out and there's no bias! I can see where the publishers would be coming from. But then again that's the risk the author would want to take. And thanking someone for loving their book seems like a nice thing to do! I agree. I think it's actually really exciting and nice if an author leaves a quick comment on a positive review on Gooreads to the effect of "I'm so glad you enjoyed my book!" But it's weird when authors comment on negative reviews. Even if they're perfectly professional and polite, I kind of hate knowing that the author actually read my negative review. I mean, I think readers have the right to say what they want about books and I don't feel bad about not liking every book I read, but that doesn't mean I want to go up to the author's face and say, "Just so you know, your book stinks." Knowing they read my negative review makes me feel like I did that, and I feel mildly bad. I completely agree with you. I love it when authors respond to my positive reviews and I only ever tag them if I literally had nothing bad to say about it. I know some people tag authors in bad reviews so maybe some authors just don't watch/read any reviews of their books at all. Just in case they are bad. But I don't think there is a problem at all with them engaging in positive reviews. I think it's just a matter of respect. If I send a review to an author, I usually do this because I'm being nice, wanting them to feel appreciated with my lovely super nice review. I find it fishy when I know they saw it and don't respond. Makes me feel like my work isn't appreciated, and I'm probably not going to send another positive review to them. I love when authors acknowledge my positive reviews. I usually include the author's handle when I tweet a positive review. I do not for negative reviews because that's just mean. Twitter comments back from the author are always nice. Jewell Parker Rhodes even left a comment on my review post of her recent book - Towers Falling - and that completely made my day! I love it when authors acknowledge my positive reviews of their books! Actually, the other day I had an author re-tweet my link to my positive review of their latest book (yayyy!). However, I think that for negative reviews, authors replying can be super awkward. I've heard a few horror stories concerning authors interacting with reviewers, so I think that it's important to be a bit wary and cautious when dealing with the acknowledgement of negative reviews. This was a great post, I agree with all of your points! I'm also writing this anonymously, because I'm an author. 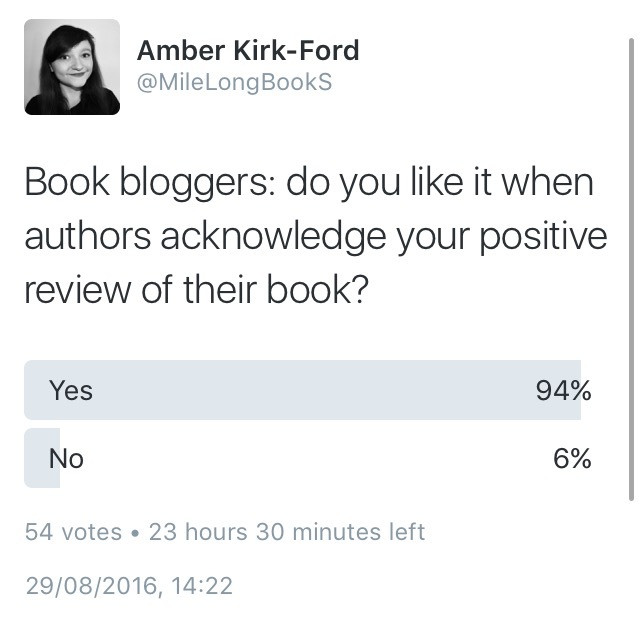 Please, please bloggers don't tag us in your negative reviews. We respect your right to criticise our work. We know that you don't mean to be hurtful. But it can be very off-putting to expect a positive review (because you're tagged in it) and open it up and find that the reviewer hated the book. Especially if the book hasn't been out long. And then (because you're tagged in it) people start retweeting the review, thinking you'll be pleased. And you can't really respond, because that looks aggressive, and you're trying to forget that review anyway. So please, think before you tag! (And if you give a 3 star, neutral review, be warned, we're going to read that as negative). I love it when authors respond to my book reviews! I only ever tag the author if I've rated the book 4 or 5 stars and I love it when they acknowledge that they've seen my gushing, fangirly review :') I once had an author comment on a negative review (which I didn't tag them in as I think it's disrespectful and quite rude of a blogger to tag authors in negative reviews), they were very polite but it was so. very. awkward. I received a response from the author on my review of his indie book just today and I didn't mind it. It wasn't a perfect review, but mostly positive. He appreciated my critique and I felt useful.